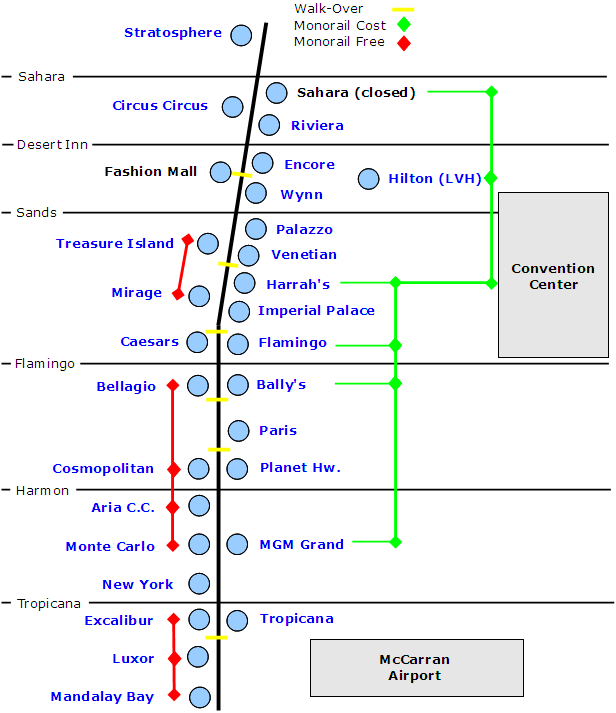 This Las Vegas casino walking map shows the best path between casinos plus mono rail locations and schedule. The "Las Vegas Strip" is approximately four miles long which is a difficult walk especially in the Nevada heat. Fortunately Las Vegas has a great monorail system that takes you the full length of the "Strip" or between major casinos. Call the Las Vegas NV office of tourism 702-577-3564 or visit the official state web site www.lasvegastourism.com for additional travel information. Almost anything goes in Las Vegas, but they do have some strict rules regarding pedestrian safety. Taxies will not stop and pick you up on the "Strip", you must be at a casino entrance or a designated taxi pickup spot to get a cab ride. Jaywalking is not allowed, you can only cross Las Vegas Blvd. at major intersections or overhead walkways (yellow on the map). The police will give you a ticket. There are several moving walkways, usually located inside and between casinos. The picture above is the moving walkway leading to Caesars Palace. Take these whenever possible to save your feet. 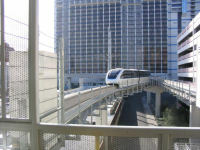 The Las Vegas Monorail has a four mile route between MGM Grand and Sahara (closed) with five stops in between. There is a charge to ride this monorail and you can purchase passes at ticket vending machines located inside each monorail station. One of the stops is the Las Vegas Convention Center, so if you are attending a convention this is the way to travel. There is no charge to ride the smaller monorails that travel between casinos (shown in red on the map). Hours: Monday-Thursday 7am-2am and Friday-Sunday 7am-3am. Cost: $5 one ride, $14 one-day unlimited pass, and $30 for three-day unlimited pass.